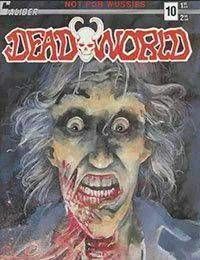 Seventeen issues mini-series.<br />Deadworld (1988) #10 continues from Deadworld (1986) #9.<br />Mike is tortured by being hung upside down from a flying helicopter over a horde of zombies. Moloch wants answers to what Mike knows about the gateway portal and King Zombie. In the prison camp a sadistic fighter nicknamed Wolverine tears up zombies in an arena and demands a tougher challenge. Dan and John find a way out of their warehouse prison via an air duct. As King Zombie watches the helicopter, he is also trailing Deakes footprints. But he is stunned when the footprints suddenly disappear. And unfortunately two of our favorite teens meet their demise in this issue.